Slopeng Beach is a tourism object located about 21 kilometers to the north from the center of Sumenep town. It is located in Slopeng village, Dasuk district. The beauty of this natural tourism object is seen from the cluster of the mountains. Slopeng beach has clean white sand, the beautiful natural scene, the coconut tree, and siwalan tree on the left and right side. On Sunday, domestic and foreign tourists crowd this place, while on holidays like "ketupatan", there is a traditional ceremony called "ketupatan event", which presents the traditional art attraction and traditional game competition. Besides its beautiful nature, Slopeng beach is also the right place to be the arena of water sports activities such as: sailing competition, and water skiing. The tourists can also enjoy the young coconut water and siwalan fruit (ta'al in Madurese language), which become the typical traditional food to be offered. To reach Slopeng beach, you can reach through coast direction: Lombang – Legung – Slopeng. 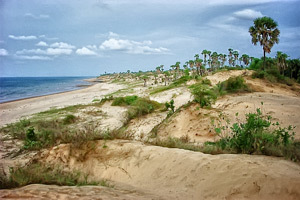 Or through Sumenep – Slopeng route, which has good road and has many transportation service along the beach.